Breathtaking sunsets await you at this resort on Maui's famous North Shore. Enjoy the comfort and service of a hotel with luxurious accommodations featuring spacious interiors, oversized tubs and separate showers in the luxury bath. Relax poolside at the acre-wide, lagoon-style pool with waterslide and enjoy outdoor cafes set amid tropical garden atriums and relaxing waterfalls. Adventure-seekers, enticed by tropical breezes and a sense of paradise, will surf, snorkel and sail in the warm, reef-protected waters. 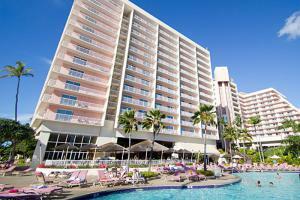 On Kaanapali Beach, approximately 24 miles from Kahului Airport and 2 miles from West Maui Airport. North Beach Grille, The Ohana Grill, Deli Planet, In-Room Dining.